Putin’s Russia: A 21st Century Film Mosaic runs through July 15 at Museum of the Moving Image. As though pulled from a cold war textbook of cartoonish villainy, Vladimir Putin has managed to superimpose himself onto the western imagination as the image of Russia itself. Often deprived of any nuance, the country and its inhabitants are rarely afforded anything more than a condescending stereotype, which usually goes to prove their congenital inability to fit the democratic standards of civilization. Such is the fright surrounding the “Empire of Evil” that large sectors of the liberal establishment have even managed to blame a quintessentially American marvel like Donald Trump on Putin, attributing him superpowers he only wishes could have. While the scapegoating has more to do with the unwillingness to face our own failings than Putin’s actual capabilities to determine the outcome of an election other than his own, the influence he exerts at home is indeed of the tyrannical kind. A question remains: is Putin the cause or the result of Russia’s systemic ills? A tentative answer might be found in the Russian cinema of the 21st century, which, as it happens, coincides with the beginning and ongoing rule of this postmodern tsar. Museum of the Moving Image’s current series Putin’s Russia explores the last two decades of Russian films, and kicked off with Alexander Zeldovich’s Moscow (2000). Though presumably written and filmed on the eve of Putin’s unexpected crowning by his predecessor Boris Yeltsin, Zeldovich’s film encapsulates the very premises—social, economic, and even existential—that made his rise possible. The film conjures the symbolic evanescence of post-Soviet society, religiously devoted to the new dogmas of profit and yet unable to own and manage this new identity. Defined by sudden wealth but afflicted by the inadequacy that comes with newly adopted personalities, the ensemble in Moscow roam the cultural void onto which the Russian nouveau riche was molded. Even the country’s pre-revolutionary heritage cannot be revived without being stained by the aesthetic bankruptcy of the new era as Russian ballet meets gangster capitalism. The new economic system, whose criminal architecture was designed with the help of America’s finest minds, is here evoked by spectral lights and a deafening emotional silence. What was supposed to be a new beginning for post-communist Russia in Moscow feels like a cul de sac, and neither the director nor the screenwriter, the novelist Vladimir Sorokin, overload it with nostalgia or rhetoric. The disastrous impact of “free enterprise” on Russian society, which is only touched upon in a transversal manner in Zeldovich’s film, gets a more literal rendition in Pyotr Buslov’s Bimmer (2003), a road movie about a gang of makeshift bandits. After stealing a BMW, the titular Бумер, the four friends are forced to flee the Russian capital for its outskirts. Their doomed flight, interspersed with wild encounters and petty criminal methods, is a pitiless overview of the social devastation and endemic poverty that came as “collateral damage” with the advent of neoliberal democracy. In the 1990s, “excess mortality” skyrocketed in Russia, mainly due to poverty and the obliteration of welfare, and life expectancy went down from 63.5 for men in 1991 to 58.6 ten years later. Bimmer also shows the brutality required to adapt to the new system: the four protagonists are criminals out of contingency rather than vocation. Instead of focusing on the inner morality, or lack thereof, of the lead characters, the film contextualizes the social origins of their behavior, and its inevitability in a world that literally offered no alternative. Moscow and Bimmer present a specular view of the kind of society that emerged from the shock therapy, the disorienting wealth of the new oligarchy on the one hand and the abject chaos of an underclass as vast as Russia itself on the other. Putin’s oratorical deception and part of his popularity still pivot on these two crucial aspects, which he claims to have set straight during his presidency. However, far from having curbed the criminal excesses of Russian oligarchs, he simply institutionalized them and put them at his own service. As for the restoration of a less chaotic social order, that was mainly due to a combination of Putin’s escalating authoritarianism and an economic growth he simply happened to preside over (and squander). The paradox of Russia’s lucrative resources and their very limited trickle-down effect is on lucid display in Vitaly Mansky’s excellent documentary Pipeline (2013). Mansky’s film follows the oil pipeline, Russia’s main tool of economic diplomacy and coercion, from the far eastern edge of Russia to the Western coast of Europe. Little of that oil’s value made it into wider Russian society, yet so immense were its reserves that something resembling a middle class came out of them in the early Putin years. The first phase of Putinism was in fact marked by further economic reforms, Pinochet-style, with Russia siding with America in the war on terror and even courting a possible NATO membership. As long as American investors had a share in the Russian market and their geopolitical ambitions matched, tensions between the two former enemies seemed to be a thing of the past. Cinematographically, this momentary realignment is best exemplified by two films: Aleksey Uchitel’s The Stroll (2003) and Timur Bekmambetov’s Night Watch (2004). Both in their own distinct ways give cultural evidence of the short-lived dalliance between Russia and America. The Stroll is a Linklater-esque rom-com of idiotic proportions chasing a triangular love-at-first-sight on the streets of St. Petersburg, which is seen buzzing with carefree optimism and consumer euphoria. Bekmambetov’s film instead is an embarrassing and failed attempt at replicating a Hollywood blockbuster. Their mediocrity notwithstanding, the two films are valuable records of a time when a nascent middle class deluded itself that the American Dream had finally graced the cheerless expanses of Mother Russia. But as the writer Kirill Medvedev pointed out, “There was no bourgeois revolution, no ‘rise of the middle class’; instead, we had the creation of a vulgar, vicious, largely ethnic-based clan capitalism.” The vast majority of this new ruling class descended directly from the Soviet apparatchiks of yesteryear, those who presided over public assets under Communism were the ones who profited from their privatization (western liberals’ darling Mikhail Khodorkovsky was the deputy head of the Communist Youth League before becoming one of Russia’s richest and most powerful oligarchs in the nineties). The girl in The Stroll at some point boasts about her inherited wealth coming from an uncle, “a sculptor who built Lenins all over the world.” While the vast majority of the country nearly starved to death, a hereditary elite of privileged individuals enjoyed something virtually no Russian had ever experienced before: freedom. The 1990s were a time of violent inequality, when basic human rights like housing, minimum wages, and health care were crushed overnight—but for the first time in the history of Russia those who could afford it were free to say, write, direct, read, watch, publish, and buy (almost) anything they wanted. Some of this freedom survived the early years of Putin’s rule and can be detected in films like Ilya Khrzhanovsky’s 4 (2004) and Sergei Loban’s Dust (2005). The former is a remorseless descent into the subconscious of the vast Russian soul and its stoical flesh, a film of aggressive expressionism in which even the wildest speculation feels vivid enough to be real. Like Moscow, Khrzhanovsky’s film is also written by Vladimir Sorokin, whose books and scripts are helpful maps to navigate the contradictions of post-Soviet Russia (his 2006 novel Day of the Oprichnik portended the fascistic orthodoxy of Putin’s neo-Tsarism). Dust is a zero-budget flick in which paranoid sci-fi and the slacker comedy are filtered through a distinctly Russian prism. Unlike Night Watch and The Stroll, where the tropes of American cinema are merely aped, in Loban’s film there is a dialogical appropriation of forms that makes the film resonate if not universally at least generationally. Dust deliriously anticipates the digital reconsideration of reality and its virtual counterpart, mixing political conspiracy with absurdism. Notable is the character of the “Professor,” played by the cult musician Pyotr Mamonov, who went from collaborating with Brian Eno in the 1980s to becoming a reclusive orthodox hermit. However hyperbolic his parable may appear, it does epitomize the wider social trajectory that Russian society experienced over the last three decades. After the genuine hopes of freedom Perestroika had raised were mostly disattended, after the promises of individual emancipation peddled in the 1990s and 2000s failed to lift the lower classes out of poverty, Russia found itself under dogmatic despotism. Religion replaced state ideology, nationalism supplanted bourgeois aspirations, and yet another autocrat emerged from the wreckage of neoliberal freedom. There is an eloquent sequence in Mansky’s Pipeline in which a train wagon repurposed as a traveling orthodox church offers its spiritual services to the remote communities the pipeline passes through. Almost a century prior to the filming of this scene, agit-trains used to travel in the same remote regions to popularize Soviet cinema and the revolutionary messages they incarnated. Recent films have tackled the resurgent authoritarian character of Russian society, its lapse into religious conservativism and state-sponsored homophobia. Both Kirill Serebrennikov’s The Student (2016) and Andrey Zvyagintsev’s Leviathan (2014), though verging on the pamphleteering, depict the dynamics at play in contemporary Russian society. What these and other films do not pinpoint, though, is that Putin’s dictatorial turn coincided with the economic crisis and his contested re-election in 2012. As the dividends of gas and oil started waning, nationalism and its related brand of toxic machismo replaced the consumer dream. The very people who profited the most under the first decade of Putin’s rule turned against him, while those who were left empty-handed and rancorous by the inevitable inequity of the free market found in the ransom of nationalism (which in Russia as anywhere else is mere electoral bait) a most effective outlet for their frustration. It is in this respect that Jessica Gorter’s Red Soul (2018) delivers a valuable insight into the symbolic economy of Putin’s following. By exploring the canonization of Stalin at the hands of the Russian establishment (and Church) over the last few years, the director uncovers the cultural logic behind the president’s most recent phase. Putin turned from neoliberal hero into chauvinist villain, all the while business between evil Russia and the democratic western world went on as usual. The historical revisionism that has rehabilitated Stalin as a nation-builder and reduced Lenin and the early Bolshevik guard to the role of demonic fiends has very much to do with Putin’s own self-legitimization strategy. The Russian president too is sold (by the media) and bought (by his supporters) as a paternal strongman who has restored Russia’s greatness. That he has actually presided over the systematic embezzlement of the country’s wealth is another matter altogether. The smokescreen of the new cold war, which grew thicker after the war with Ukraine, proved too impenetrable for filmmakers to debunk its self-serving myths. Perhaps the only film that (in)directly addressed the systemic causes fueling Putin’s ascendency is Svetlana Baskova’s Za Marksa… (2012), which explores the economic roots and aesthetic implications of Putinism rather than simply marveling at the brutality of its symptomatic manifestations. Yet despite his iron-fisted grip on society, the president of the Russian Federation is not Superman, nor does he determine everything that happens from Kaliningrad to Vladivostok. Proof of Putin’s overestimated influence on culture can be found in Aleksei Balabanov’s Me Too (2012) and Aleksei German’s Hard to Be a God (2013), moving testaments to the recondite luminescence of Russian cinema, both of which turned out to be their directors’ last works. Hard to Be a God is the coronation of a sparse but vertically momentous career of a veritable giant of soviet cinema. A shamanic adaptation of the Strugatsky brothers’ eponymous book, German’s film is a corporeal experience in which the spectator is physically thrown into the mud of existence. The film is pockmarked with allegorical leads but decomposes every narrative cue into a lysergic Bosch-like morass, from which it’s impossible to emerge unscathed. Hypnotic traveling shots capture a world of unspeakable cruelty as if it’s unfolding in real time. An incessant parade of amputated limbs, swollen stomachs, warped facial expressions, flaccid posteriors, pilloried slaves, sadistic knights, and animals of all kind materializes in front of the camera like in a nightmare. The film is a viscid journey through the entrails of civilization and the miasma of their putrescent lies set in a Middle Ages of the future—a world in permanent conflict where culture is the enemy and xenophobia legalized, maybe about Russia, most probably about the whole imperial world. A work of erudite secularism, German’s film finds in Balabanov’s Me Too a sort of spiritual counterpart. A bandit, a musician, and a random alcoholic go on a pilgrimage to the “bell-tower of happiness” where, legend has it, felicity can indeed be found. Like in Erofeev’s books, spirituality is here devoid of any clerical connotation, as the conduit to the higher being is not the church or its functionaries but alcohol. Vodka is the fourth character in a film that’s only ostensibly comical for its essence, but is in fact deeply philosophical, like a bare-fisted combat with the meaning of life. The profundity of a country with a constitutional aversion towards banality, the reluctance to compromise, and a surprising, selfless generosity is encapsulated in a film that is disarmingly simple and yet ancestral. Needless to say the pursuit of happiness is of total irrelevance to the protagonists of Me Too; what is at stake is the unresolved pain of life, which Russians have historically faced with a self-annihilating determination. 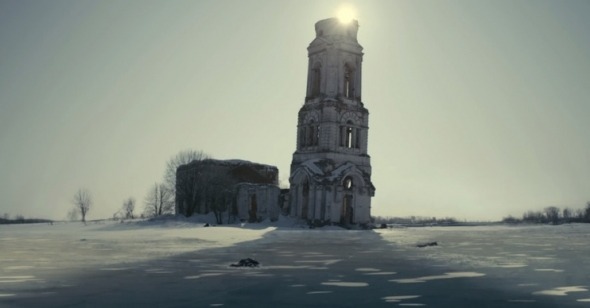 The crumbling “bell-tower of happiness” where the film ends finally collapsed 40 days after the death of the director, who had granted himself a last cameo in its shadow. According to orthodox religion, that’s all the time it takes for the Russian soul to leave earth after dying.